This is the best premium-subcompact crossover for you if your priorities place style slightly ahead of substance. Hoping to make its least expensive crossover more attractive to budget-minded shoppers, Audi adds a new entry-level Premium trim for 2017, and adds standard features to the midrange Premium Plus grade. Along with such rivals as the BMW X1, Lexus NX, and Mercedes-Benz GLA, the Q3 belongs to a fairly new automotive segment — one enjoying explosive growth. On sale in overseas markets since model-year 2011, this five-seater made its U.S. debut for 2015, slotting below the compact-class Q5 in Audi’s crossover lineup. Wait, if you believe reports suggesting Audi will release an all-new Q3 for model-year ’18. Other sources say the redesign will come for model-year ’19 or ‘20. Point is, the next-generation version is on the horizon, leaving today’s model showing its age despite a slight freshened for ’16. That said, the 2017 Q3 is a stylish and pleasant, if unexciting, crossover. Premium Plus and top-line Prestige trim levels return. They’re joined for 2017 by the new entry-level Premium. Priced $2,700 below the Premium Plus, it nevertheless comes with a surprising level of standard equipment (again, see below for details). All models use a turbocharged four-cylinder engine. Front-wheel drive is standard, and Audi’s excellent quattro all-wheel drive (AWD) is optional. Carried over are revisions to the grille, headlights, and interior and exterior trim that were part of the model-year 2016 refresh. They updated the Q3’s looks but it remains the oldest and most conservatively styled crossover in the class. There’s little obvious visual difference between the Premium and Premium Plus trim levels. Both come standard with xenon headlights with LED daytime running lights and tail lamps, and a power panoramic sunroof. Upgrading to the Prestige nets full LED headlights, 19-inch wheels (up from standard 18s on other trims), and Audi’s “S line” sport body kit. All models benefit from Audi’s stellar interior design. Rich leather upholstery is standard. Other materials quality looks and feels like it came right out of the brand’s A8 flagship. Front-seat occupants will have sufficient room on comfortable bucket seats. However, despite having larger exterior dimensions than the diminutive Buick Encore, Q3 has less rear-seat legroom (31.1 inches vs 35.7 inches) and cargo space (16.7/48.2 cubic feet vs 18.8/48.4 cubic feet with the rear seatbacks up/folded). For the most passenger and cargo room in the premium-subcompact-crossover class, seek BMW’s newly redesigned 2016 X1. All models come with a 2.0-liter turbocharged four-cylinder engine with 200 horsepower and 207 pound-feet of torque. It pairs with a 6-speed automatic transmission. Front-wheel drive is standard. Audi’s quattro AWD is optional on all models. It’s a feature we would recommend as it provides a tangible handling benefit, even on dry roads. Audi claims 0-60-mph acceleration of about 8.0 seconds, which feels right to us. There is some turbo lag, and we occasionally experienced a slight delay in throttle response accelerating from low speeds. It’s unfortunately a characteristic of this engine, as we’ve observed this behavior in other Volkswagen and Audi products that use it. A complete list of standard and optional equipment for the 2017 Q3 was not available in time for this report. We do know that the Premium comes standard with leather upholstery, heated 12-way power front seats, and a panoramic moon roof. Previously optional, the Premium Plus now includes heated power folding exterior mirrors and a programmable power liftgate. Prestige versions add Audi connect infotainment, in-dash navigation with Google Maps support, blind-spot alert, and a Bose-brand audio system. These items, sans the Bose stereo, are optional on the Premium Plus as part of a Technology Package. Note that rear cross-traffic alert, radar cruise control, forward-collision warning, and lane-keep assist are not offered. The optional Sport Package for the Premium Plus and Prestige adds steering-wheel gearshit paddles, sport bucket seats, and Audi Drive Select, which allows drivers to electronically alter transmission and throttle response. It makes driving slightly more engaging, but it still doesn’t match the sporty moves of the X1 or Lexus’ surprising NX. Only 2017 base prices were made available in time for this report. 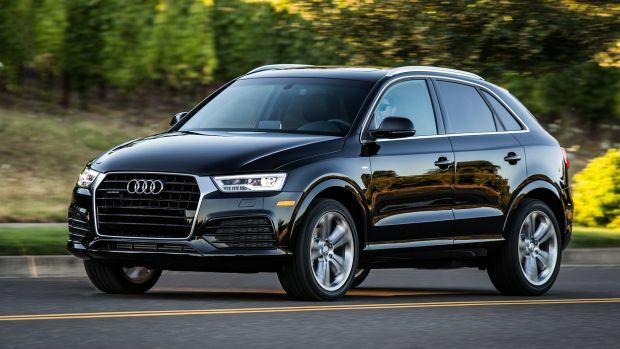 With front-wheel drive, the Q3 Premium lists for an attractive $32,750, including Audi’s $950 destination fee. Expect options on this model to be limited to a power liftgate ($400 on the 2016 Premium Plus) and a no-charge black cloth headliner. The Premium Plus starts at $35,450, an increase of about $800 over the 2016 model, though it does come with more standard features, which we mentioned above. The 2017 Prestige will check in at $40,150, an increase of $625. AWD adds an extra $2,100 to all models. Expect the Sport Package and any paint color other than black or white to set you back an additional $550 each. The Premium Plus’ Technology Package should be about $2,600. Our pick of this line is the new Premium model, as it offers a decent amount of equipment for its starting price. Still, with passenger and cargo room, as well as fuel economy and driving dynamics that don’t match most of its rivals, the overall Q3 package feels like slightly less than the sum of its stylish parts. While 2017 EPA-estimated fuel-economy ratings were not available as of this writing, since changes are minimal, we expect Q3’s 2016 figures to carry forward. This crossover scores 20/29/23 city/highway/combined with front-wheel drive and 20/28/23 with AWD. Taken by themselves, the numbers seem good, but AWD competitors from BMW, Buick, and Mercedes-Benz all average at least 26 mpg combined. This is unusual because the Q3 doesn’t suffer much of a weight disadvantage over these competitors. Audi requires premium-grade 91-octane fuel. 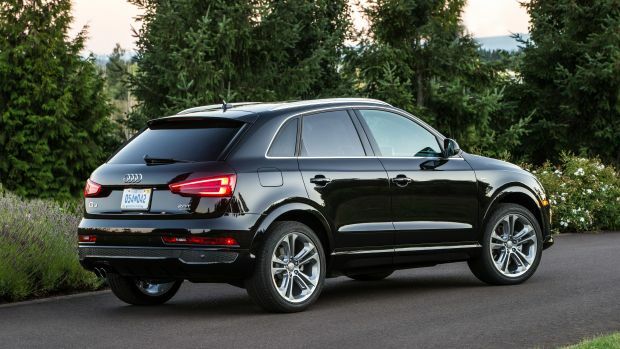 The 2017 Audi Q3 should be in showrooms by summer 2016. What’s next for the Q3? Spy photography has captured the next-generation Q3 undergoing development testing. It’ll be about the exterior same size as today’s model but will transition to parent-company Volkswagen’s modular “MQB” platform, the same structure that underpins Audi’s A3 sedan as well as the mainstream VW Golf. The result will likely mean more rear-seat space and cargo volume, two areas the current Q3 falls short. We also expect this new model to be brought up to date with the latest safety and driver-assist features that are lacking on the current Q3. The engine will likely remain a 2.0-liter turbo four-cylinder, but with at least 10-20 more horsepower. The transmission should also be upgraded to an 8-speed automatic. Both these changes should result in better fuel economy. US-market models will likely come from VW/Audi’s new SUV assembly plant in Mexico.